I’m always on the lookout for outdoor furniture that’s easy to move and that will easily adapt to new spaces, so I was really excited when Slim furniture asked me to try out their new line of flat packed outdoor furniture - I was amazed at how light it was (it’s made from rust proof aluminum frames) and how easy it was to put together without ANY tools, take apart and to move by myself! The whole process was way easier than putting together furniture from IKEA. 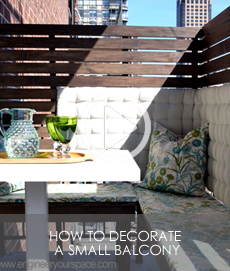 And every piece of furniture has storage built-in - so useful for smaller outdoor spaces like small balconies! You can only purchase Slim furniture online: it’s available on Amazon.com and you can also check out Slim Furniture's website to find out more about their furniture and purchase it there.